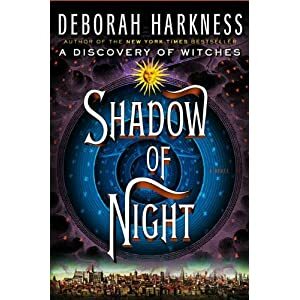 I have been waiting for Deborah Harkness’s second novel, Shadow of Night: A Novel (All Souls Trilogy) , since the second I put down the first book in this trilogy (A Discovery of Witches ). I read that book from cover to cover in one sitting, and then reread it again. And then checked it back out of the library a couple weeks later! It recently popped up a the Nook Daily Find, and I snapped it up for my Nook at a bargain price – talk about making my day! I was on vacation in the Outer Banks when my Advanced Reader’s Copy of the newest book arrived. I could hear it calling to me, all the way from home. I could not wait to dive into this engrossing story. Shadow of Night hits shelves today, so you can go pick it up right now! This book in no way disappoints! Harkness has some serious skill as a historian; I am mildly obsessed with all things related to Elizabethan England (and Europe), so her attention to detail was something I found refreshing. I am always a little nervous that subsequent books in a series will not live up to the debut – this book actually surpasses it! Matthew and Diana’s love story goes to a whole new level, and is tested in ways neither could have imagined. The historical characters peppered throughout the book are wonderful additions, and seeing how the Matthew of that era interacts with them is almost like seeing a whole new character. Harkness expertly crafted a historical world that is honest and real, and won’t allow you to walk away from it. This book ends with a cliffhanger, as its predecessor did. I don’t ever like to share spoilers, so I am literally sitting on my hands to keep from sharing too much of the story. Suffice it to say, if you at all like history, science, art, literature, vampires, and witches, this book should be at the TOP of your list!! (I do recommend that you read Discovery of Witches first – the second book will make more sense them) . If you’ve read Discovery of Witches, I’d love to hear your thoughts on it! Are you looking forward to Shadow of Night?